Chinese cuisine is one of the most vibrant in the world. 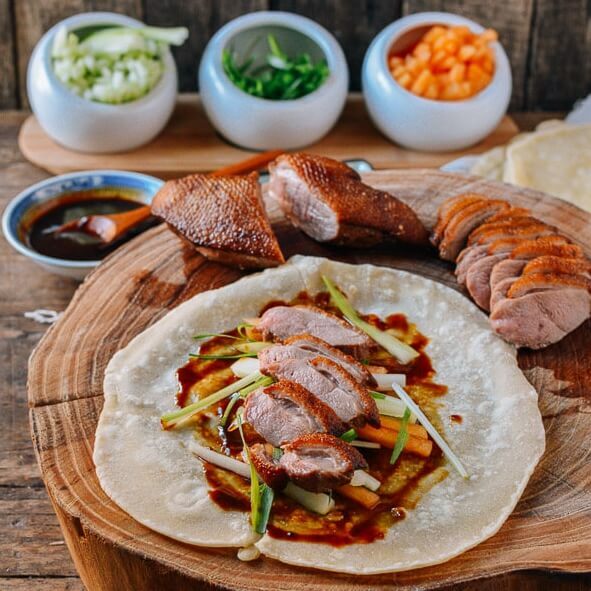 If you wish to get the true Chinese experience with everything that includes, then it’s mandatory to try one of the most well-known culinary delicacies in a true Chinese restaurant: The Peking duck. The real Peking duck is served only in Beijing. The culinary experience of the consumer is decided not only by the quality of the meat, but also its method of preparation and serving. The most important part of a good Peking duck is its skin. This duck meal is prepared by specially trained chefs who are at the table with their customers and prepare the meal directly in front of them. Specifically, the slicing of the duck requires special ability, as each duck is cut into exactly 120 pieces with each piece having a specific amount of meat and skin. This skin is not the same as from normal cooking, dry, thin, and hard to chew. Instead it is soft and delicate, melting on our tongue with each bite.